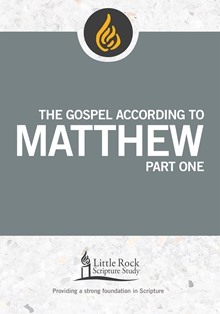 Standing at the start of the New Testament, the Gospel of Matthew provides a bridge from the Jewish world awaiting a Messiah to the emerging Christian world of Jesus and his followers. This Gospel introduces us to Jesus as the Master Teacher whose words of instruction are captured in large teaching sections. Part One covers Matthew 1:1—16:28, from the birth of Jesus through much of his public teaching life, to the first prediction of his passion. Commentary, study and reflection questions, prayer, and access to recorded lectures are included. 5 lessons..